I recently changed from using a Macbook Pro to a newer smaller 15 inch model but I wanted to do a critique of the old machine because it is such a workhorse, and not only survived the rigours but exceeded my expectations from a desktop replacement machine unlike any other laptop I have owned. Starting with first contact you can feel that this machine is put together well. I had owned many Dell laptops before this machine and use Lenovos at work currently but nothing I have seen compares to the external simplicity and rugged nature of the Macbooks aluminium case. Internally its clear that the Apple designers spent a lot of time fitting together the units constituent parts to fit in the chassis as efficiently as possible. Venting: The mac expels air via a slit alongside the hinge. My previous Dell machines and others had vents that exited the chassis on the underside. The problem with the latter design is in the generic name of the device: laptop i.e. when using it on your lap you don't want expelled hot air onto your knees. The Macbook vents along the hinge address this issue. Internally the design is clearly thoroughly considered e.g. the battery running alongside the front of the chassis, next to the main disk drive where the users wrists would naturally rest. Thus you don't get hot hands whilst using it. This is an Intel based machine so if you don't like Mac OS then you have the option of installing Windows or Linux, or even multi booting. Personally I used MacOS with a virtual host (VirtualBox, VMWare or Parallels at various times) for alternative OS installations. I found the machine amply capable of running both a host and guest. Unlike todays machines this Macbook has a full suite of connectivity sockets including LAN, Firewire, Thunderbird and of course USB. Particularly when visiting a new office, when provisioning or configuring other equipment to have all these ports available was extremely useful. Unlike the modern versions this model of Macbook Pro has screws that you can undo and thus you are able to replace the memory or upgrade the hard drive. I put in 16GB of memory, even though it only officially supports 8, it is widely know to work with 16. I also put in an SSD drive. This transformed the machine from an already capable model into a really fantastic machine. This isn't an Apply love-in. The machine did have its faults however they were addressed by the supplier in such a way that they were a non issue. Logic board: GPU became unreliable, resulting in a blue screen and auto-shut off. According to my research this is not uncommon for these models. The suggestion online was that it is caused by the heat cycles of the GPU rendering the heat-sink paste useless. Despite happening well after the guarantee had run out, Apple took the device in and replaced the logic board for free in under 12 hours! Headphone socket: Would sometimes not switch from optical to analogue when an analogue was plugged in. A USB adapter was a temporary solution but the logic board replacement seems to have fixed that. Power supply: The DC cable frayed at the point at which it leaves the transformer. On returning it to Apple store they replaced it on the spot for free with no questions asked. To date this is without a shadow of a doubt the best laptop machine I've ever owned and in 15 years of programming I've used a lot of machines. I found the extra weight was worth the effort for the beautiful screen. However, I no longer travel so much so I don't need the larger screen that this unit provides so I'm selling it on. I am sure it will go on to provide many useful years of service yet to it's next owner. 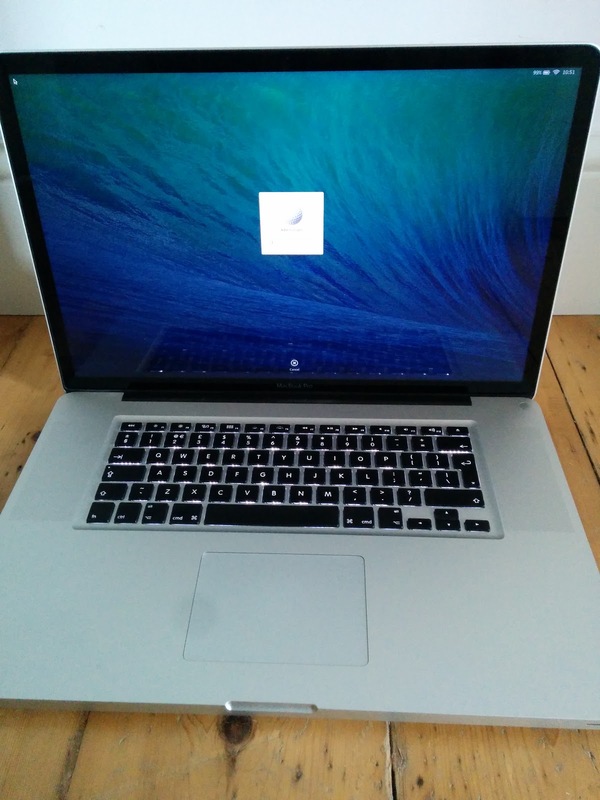 Macbook Pro 17 inch on ebay.